The church is usually open every day from 9.00am to 4.00pm, with worship at 11.00am on Sundays. Information about services and special events is available on the porch notice board. The church building has recently been adapted to provide a Community Space, which is for hire (details in COMMUNITY SPACE). All our Services are Family Friendly. Tea and Chat – twice per month at 2.30 pm, day varies. Harvest Celebration - This year on Sunday 21st October and Harvest Supper is on Saturday 29th September. Act Of Rememberance – This year on Sunday 11th November beginning at 10.45 am at the War Memorial. Christmas Eve - Village Service at 7.00 pm on Christmas eve. Joint services with Milton Methodists are held on several occasions during the year, including for St Blaise Day, Palm Sunday, Remembrance Sunday and Christmas Eve. Annual Tadpole Feast (Village Fete) and Barn Dance. £12 per hour for social and commercial use by non-residents. £10 per hour for residents of Milton. For more information please contact Joy Browning send mail tel: 01235 834869, or Nicola Turner send mail tel: 01235 833938. Milton is an abbreviation of the original name of the parish, Middletune, which means ‘the middle tun’, the middle village of a group of villages. The church is dedicated to St Blaise, the patron saint of wool combers, Milton being a centre of the wool industry at the time the church was built. 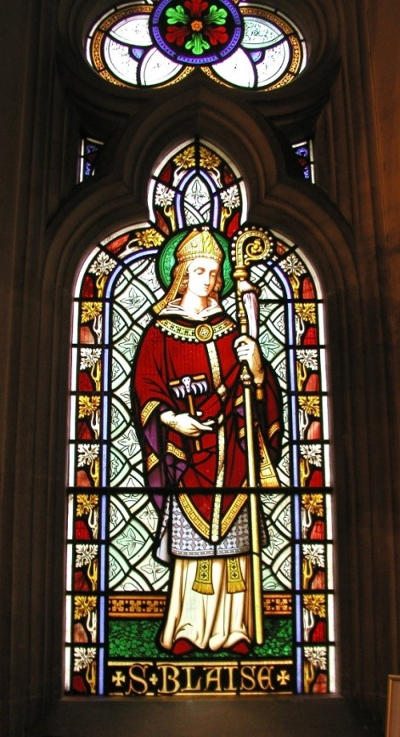 There are only three other churches in England dedicated solely to St Blaise. Beneath the chancel steps of the church is the Barrett Vault, built in 1769 for the Catholic family at Milton Manor House. Here a unique burial took place in 1781, that of the Roman Catholic Titular Bishop of London and Salisbury, Richard Challoner – this was only three years after Catholic priests in England were able to emerge from hiding and just six months after the anti-Catholic Gordon riots in London. The Church of England burial service was used by the Rector, who in the Register describes the Bishop as ‘a very pious and good man, of great learning and extensive abilities’. In 1946 the Bishop’s coffin was removed for reburial at Westminster Cathedral. The earliest recorded reference to Milton states that in 956 King Edwy gave fifteen hides of land in Milton to his thane Alfwin, who gave them to Abingdon Abbey. Of the Saxon building nothing remains. The present church dates from the early part of the 14th century, though largely rebuilt in the mid-nineteenth century by the architect Henry Woodyer, who introduced plenty of his original mouldings. The church is a Grade II* listed building. All that remains of the 14th century church is the porch, the lower parts of the tower and the south west corner of the nave. The stone roof of the porch originally had no tiles on the outside, like the Treasury roof at Merton College Oxford, which is of the same date. It is not known what the 14th century entrance–arch from the churchyard was like; the present one dates from the 16th century. Hand-made glass was put in the windows in 1959. The base of the tower also dates from the 14th century. In the north-west corner is a tombstone to William Heath, d. 17 April 1651. The Register of 1758 states the fee for burying in the tower, so presumably it was customary to bury there. The original clock was made by a local blacksmith and had only one diamond-shaped face. It was bought by money paid in fines by pheasant poachers, and when the clock struck the hour villagers used to say, ‘Hark to the old pheasant crowing!’ The present clock was made by Gillett & Johnston in 1923 and was a gift to the church from Sir Mortimer and Lady Singer of Milton Hill House (and of Singer sewing machine fame). 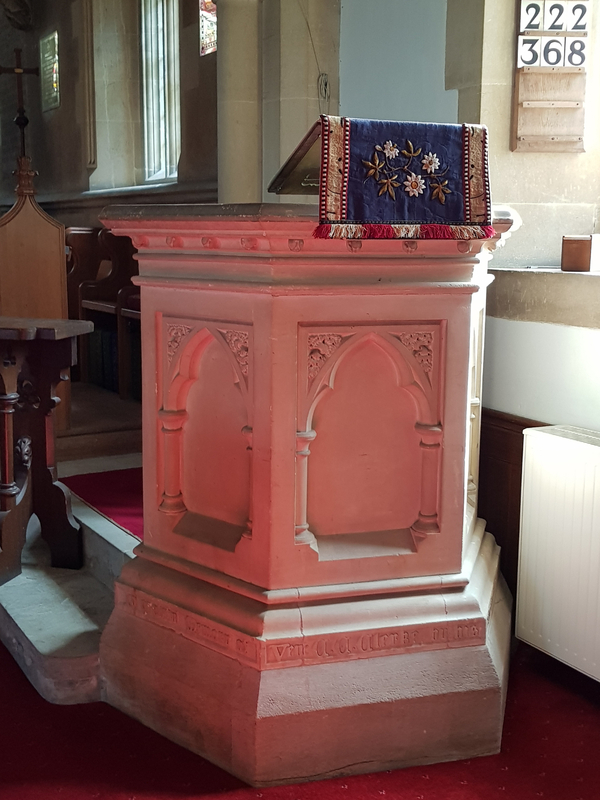 The pulpit was given in 1879 in memory of Archdeacon Clerke, Rector from 1836 to 1875 who was responsible for the alterations to the church. The chancel of the 14th century church began at the step in the nave, the present chancel steps being the deacon’s and sub-deacon’s steps in the original pre–reformation Sanctuary. 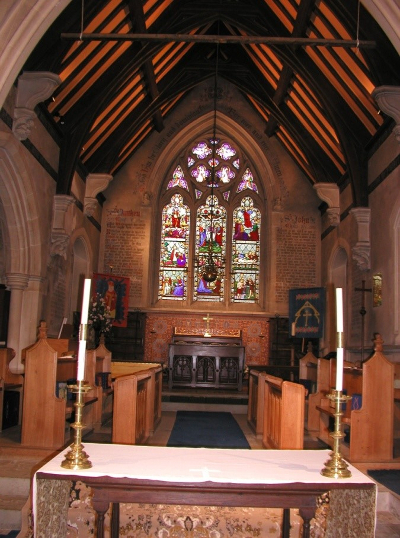 The present chancel dates from 1851. At that time it was divided from the nave by wide stone balustrades, which were removed in 1955. The Victorian choir stalls were refashioned in 1966. The east window is the work of Michael O’Connor in 1851; each scene has been inspired by the work of a famous artist. Four of the pictures that were the inspiration for this window are in the National Gallery in London. Behind the altar the retable has recently been re–built, and the Victorian tiles restored. Interestingly, the old panels on the east wall, with gold leaf lettering, date from the time of Queen Anne, and were retained at the time of the 19th century alterations. The candelabrum is a prized possession. It dates from the middle of the 17th century. At one time it was in use at New College, Oxford and bears the inscription saying that Henry Nobes, Senior Steward of the College, presented it. Its route to Milton is unknown. A second–hand chamber organ was given to the church by Sir Mortimer and Lady Singer in 1926. This gradually became unusable and in 2004 was replace by an electronic organ. The chamber organ had a fine oak case with gold tracery, which has been reused to make the screen between the north aisle and vestry. The screen between the chancel and vestry was made as a reredos in 1905, but was repositioned when the pipe organ was removed. Marble memorial tablets on the south and north walls of the vestry, high up and almost out of sight, commemorate the Warner family, two of them Rectors of Milton, who founded the village school and also gave the patronage of the living to Christ Church, Oxford. The north aisle was added in 1817 by Thomas Bowles. It was narrow, and separated from the nave by wooden pillars. In 1851 this aisle was replaced by the present one. The second north aisle, designed by George Street, was paid for by John Samuel Bowles and his siblings in memory of their parents, Thomas and Frances Bowles who are commemorated in the Michael O’Connor window at the west end of the aisle. Under the Chancel in addition to the Barrett Vault is a Crypt where the wife of Henry Woodyer, the architect who rebuilt most of the church, lies buried. Cremated remains are also buried in this crypt, in niches in the east wall. This is said to be the first Parish Church in England to be allowed to do this. 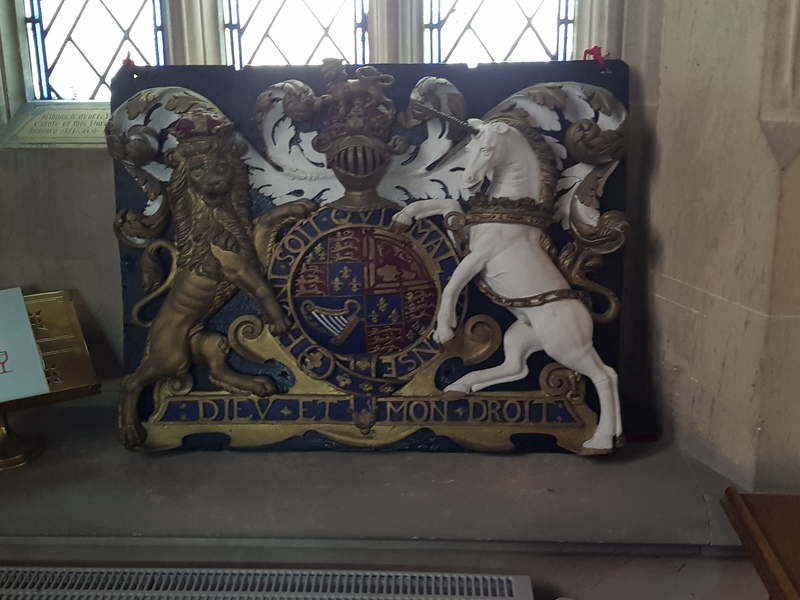 The royal arms of the Stuarts was placed in the church at the time of the Restoration of Charles II in 1660. The gold leaf is thought to be original (1660). In the churchyard, standing near the south eastern corner is the original bowl and octagonal base of the font of the 14th century church. The pedestal is of much later date.